Lallemand offers a specialized range of Fermentation NutrientLallemand Fermentation Nutrients Ingredients (FNIs... More Ingredients (FNIs) that can help you achieve higher metabolites production. In facts, FNILallemand Fermentation Nutrients Ingredients (FNIs... More products perform not only as «bug booster» but also have a positive effect on metabolite expression such as proteinNutritional yeast grown under controlled condition... More. Supplementation of media with inactive yeastYeast is a unicellular fungus that can convert sug... More can also be used to maintain the biomass and the release of metabolites in fermentation media. They are suitable for a broad range of industrial fermentations such as enzymes production, therapeutic proteins (insulin, anticancer agents), antibiotics, flavor compounds, cosmetic ingredients (hyaluronic acid), chemical molecules (biopolymers, organic acids, amino acids…), and biopesticides (toxins). Lallemand has a varied product range composed of yeastYeast is a unicellular fungus that can convert sug... More peptones (including yeast extractsYeast extracts are flavour contributor and flavour... More), yeastYeast is a unicellular fungus that can convert sug... More autolyzates and inactive yeastYeast is a unicellular fungus that can convert sug... More, which are available as liquid and powder. The content of these products varies in B-vitamins, nucleotidesNucleotides are organic molecules composed of nucl... More, mineralsMinerals are elements that originate in the earth ... More, alpha-amino nitrogen content, and other bioactive compounds, in both their active and natural forms. FNI 100 ag, has been selected to be effective for protein expression by E.coli with low acetate production. Autolyzed yeast is produced by inactivating the natural enzymes endogenous in yeast cream and then by adding enzymes to the soluble fraction. After the hydrolysis, the yeast slurry is simply dried without separation of the cell wall material. Therefore, contrary to yeast peptones, yeast autolyzates contain the soluble proteinaceous compounds as well as the cell wall material. Lallemand autolyzed yeast has been shown to support the growth of Lactobacillus and other bacteria. Products are also suggested for second metabolites production. The yeast cell material provides complex ingredients for long lasting release of components (see graph). 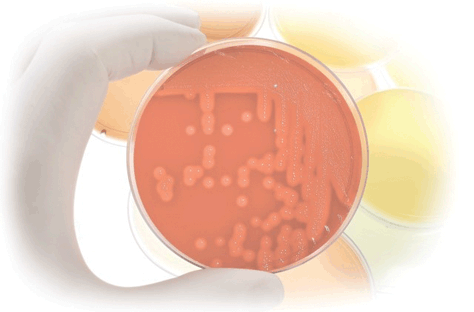 FNI 100 ag, has been shown to be effective for many non-fastidious microbial cultures.